To start with, the most popular theory as to why Friday is considered unlucky or an evil day is thought by many to spring from Christianity. By tradition, Friday is considered the day that Eve gave Adam the “apple” and they were kicked out of the Garden of Eden- of course, “Friday” wouldn’t have been around yet. Others theorize that Friday being unlucky predated Christianity. The name “Friday” was chosen in honor of the Norse goddess Frigg, also known as Freyja, who was the multitalented goddess of love, beauty, wisdom, war, death, and magic. Teutonic people are thought to have considered the day extremely unlucky, especially for weddings, due in part to the lovely goddess the day was named for. Later, the Christian church attempted to demonize the goddess, so that may or may not be a contributing factor as well. Whatever the case, despite these quite old origin theories, well documented instances of the notion that Friday was popularly considered unlucky among the masses doesn’t seem to have popped up until around the mid-17th century. Within the next two centuries after that, the idea continued to spread and by the 19th century was nearly ubiquitous in certain cultures. As with the notion of Friday being unlucky, “13″ being popularly considered unlucky really seemed to gain steam around the 17th-18th centuries, and by the 19th century in the Western world was likewise extremely widespread in several different cultures. 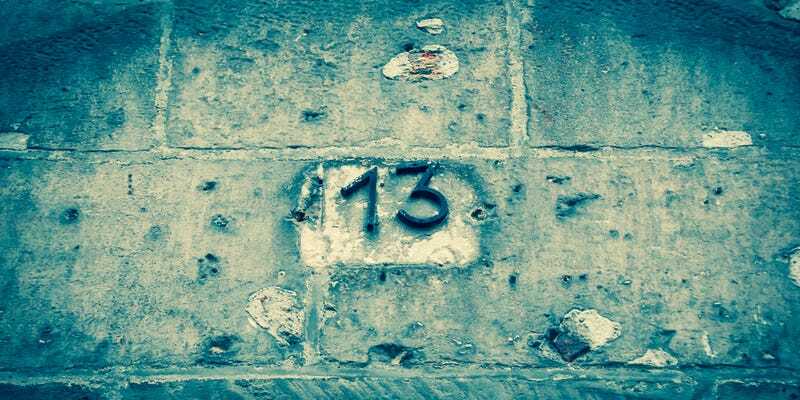 It perhaps isn’t surprising, given that both Friday and “13″ as unlucky didn’t reach their zenith in popularity until the 19th century, that it wasn’t until around the mid to late 19th century that the two were put together as the ultimate unlucky day. The Dutch Centre for Insurance Statistics in 2008 attempted to prove that Friday the 13th was no different than any other day. They ended up demonstrating the opposite. From their results, they found Friday the 13th is actually a slightly safer day to drive than other days, at least using two years’ worth of data from 2006-2008 in the Netherlands. In that span, there were an average of 7,500 traffic accidents on days that were both Friday and the 13th of the month. On Fridays that didn’t line up with the 13th, there were only an average of 7,500 accidents each day. Their theory is simply that, due to the phobia, less people drive on Friday the 13th and people are more careful when they have to. They also found similar trends with reported fires and crimes, with less happening on Fridays that coincide with the 13th day of the month. Kathy Padden writes for the wildly popular interesting fact website TodayIFoundOut.com. To subscribe to Today I Found Out’s “Daily Knowledge” newsletter, click here or like them on Facebook here.